Weekly Penguin is our regular feature that has been running since 2007 – and that means we've now reached the epic milestone of 500 featured penguins! That surely needs to be celebrated, so how about we do that with a new TAGAP 3 villain reveal? The Funky Warden is the supervisor of Pluto's prison complex and the leader of the entire PDOC (Pluto Department of Corrections), Pluto's law enforcement arm. 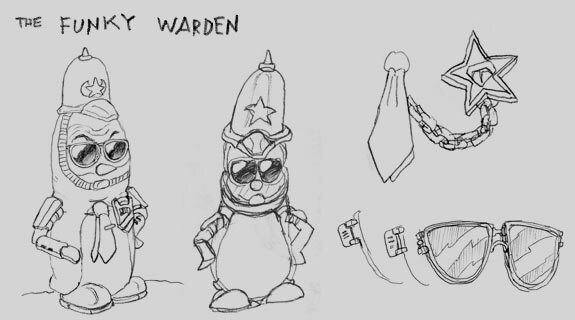 In this position, the Funky Warden is not only responsible for the safety of the public and the day-to-day operations of the prison facility, but he also supervises the entire surveillance network of Pluto. Whilst The Funky Warden commands all his constabulary to conduct themselves well in public, when it comes to upholding discipline within the prison complex, he is tough, bordering on ruthless. PDOC guards do use non-lethal force to subdue dissidents, but per the Funky Warden's instructions, bomb collars make any attempted escape a lethal mistake. The war effort hasn't softened the Funky Warden's edge, either. On the contrary; The moment martial law became to effect, he introduced death sentences as a punishment option for high crimes, such as treason. For an added effect, these sentences are committed via complete matter disintegration and citizenship data history removal; This ensures that caught traitors are utterly wiped from existence, both from physical world and the public data banks. The Funky Warden is not a nice guy to antagonise – and as it happens, TAGAP 3 begins with Pablo finding himself in one of PDOC's cells! The visual design of the character was pretty obvious. The moment I figured out that we need a tyrannical penguin prison warden, an idea of how he looks formed in my mind; A slightly over-weight tough bird wearing large motorcycle cop mirror shades. With a couple of drafts, I ended up with the final design – which is possibly best described as 'space penguin + R.O.T.O.R. + vintage British police cap + dose of Judge Dredd'. PDOC, or Pluto Department of Correction, is the law enforcement arm of Pluto. It holds its headquarters in a massive supermax prison complex, located in the most isolated of all the atmodomes. The prison houses all the prisoners of Pluto – from the genuinely criminal types to those of the political variety – and even has its own death row. The prison complex isn't just about prisoners, though; The ominous, tall security spire towering over the prison blocks houses surveillance computer mainframes monitoring the entire planet! Everything from communications to security cameras pump more intelligence into the mainframe for the Pluto Conclave to utilize. PDOC handles all of Pluto's police work as well, though under the martial law most of the peacekeeping is done by undercover operatives, behind the scenes. While this means the constabulary of Pluto has been relegated to working in the prison complex, it's not like they have any less work to do. After all, Pluto's prisoner count has more than quadrupled in a very short time since the declaration of the war. Not only that, but the intelligence gathered via the surveillance network is in larger demand than ever before. Now PDOC isn't tracking just criminals after the fact and under warrants, but actively monitors those merely suspected of PDOR connections. No, there isn't much privacy on Pluto these days. More cinematics and boss fight fine-tuning! The final boss-fight is about half-way ready, all the first half is missing is a couple of sound effects and an icon for boss health gauge – then it's time to move to the second half. And no, there are more than two phases in this fight, I just decided to split the whole thing in two so the players get a checkpoint in between. I'm tweaking this fight to be pretty brutal, so adding in the checkpoint is the least I can do. As for cut scenes, I've been on a roll. I've now finished one third of the intro and have inserted three more episode transitions. This is really important for the overall game flow, as the transitions between the Hub and the separate Pluto departments is actually dealt with in the cut scene scripts. What this means in plain language is that finally, after years and years, TAGAP3 is finally coming together as a solid whole instead of loose episode arcs. A handful more of these and the game will be playable from the beginning to... well, how-ever-far I've gotten in the final fight by then! Yeah, these are rough. Remember, as I do both the storyboarding AND the scripting, I'm essentially making these for myself. As such, all the details I really need in order to speed up my process is the clear depiction of the frame order and the skeletal animation poses needed. What you end up with is a bunch of glorified stick figure doodles that make sense only to me! So that's one more villain introduced, but there is still one more to go – and I can't wait to let you meet the biggest baddie from Pluto's ranks!